"He was very upset, crying and terrified." A young male deer was found last week in extreme distress, while his mother and sibling lingered nearby. 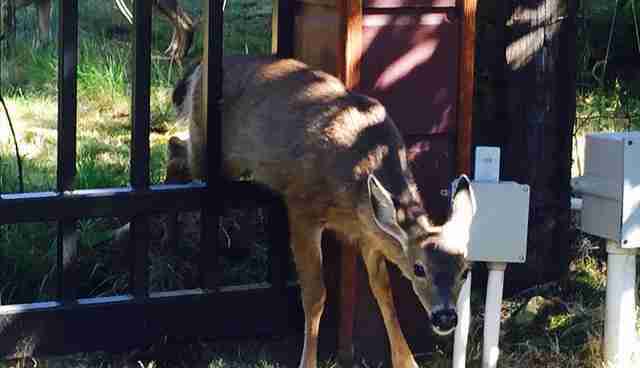 Sadly, the male deer was unable to follow after his family - because he had gotten caught between the metal rails of a fence in Marysville, Washington. When the homeowners saw the deer's plight on their property, they immediately contacted the Sarvey Wildlife Care Center to get him the help he desperately needed. "There was no way the deer was going to be able to be easily removed," the rescue wrote on Facebook. "The hips would not go through and the rib cage would not allow for it to return back the same way it went in. He was very upset, crying and terrified." There was only one way to free the fawn from the fence - by cutting him out. Despite the damage it would cause to their property, the family didn't hesitate to tear the fence down, the care center wrote. After the fawn was finally cut free, he was transported to the rescue center, where he was slowly brought out of the temporary sedation used to transport him. Additionally, caretakers treated a wound on the deer's side caused by his unfortunate predicament. The wildlife care center also treated the fawn for an illness known as capture myopathy, a form of muscle weakness that can present itself in animals who have been trapped and immobile for a prolonged period of time. Sadly, it was impossible to reunite the male deer with his family during the rescue. "The effects of the drugs and injury required that he come back to our center," the rescue wrote in a Facebook comment. "It is not ideal, but he will have new fawns to bond with and won't be alone - even at release. At least he is alive. Once these 'fawns' are this old, we rarely get them into the center. They are usually hard to catch even if orphaned at this age. This was a very unusual situation, but at least he was saved," the rescue wrote. Want to help Sarvey continue doing good work for animals in need? See how you can contribute here.